Dr. Youn-Bae Kang who is a professor of Clean Steel Lab won the TMS Young Professional Technical Division poster contest at this year's annual meeting in San Diego. 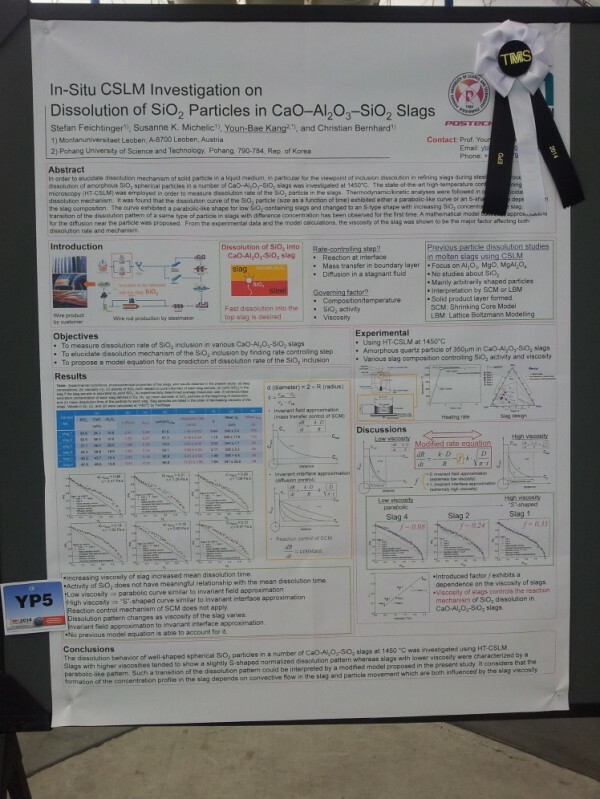 Title and authors of the winning poster is "In-situ observation of the dissolution of SiO2 particles in CaO--Al2O3--SiO2 slags and mathematical analysis of its dissolution pattern", by Stefan Feichtinger, Susanne Katharina Michelic, Youn-Bae Kang, and Christian Bernhard. This is an outcome of collaborative research work between GIFT, POSTECH and Chair of Ferrous Metallurgy, Montanuniversitaet Leoben, Austria. Mr. Stefan Feichtinger, the first author of this poster who carried out this work by visiting us, was supervised by Prof. Kang, and he is now working at Swiss Steel in Switzerland.